Solar greenhouses are complete overhead canopies built to cover garden areas. Our solar greenhouses eliminate the need for a surface on which the solar panels can be mounted to. The advantage of a solar greenhouse is that they don’t require additional area similar to ground mount solar panels. Solar panel greenhouses offer a more efficient use of space than ground mounted panels. 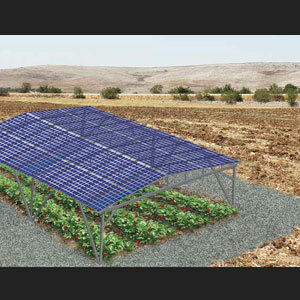 Certain states even have incentives for using solar greenhouse structures over a traditional ground mount installation.